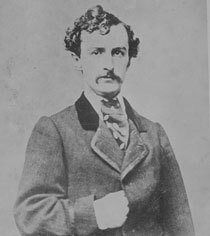 John Wilkes Booth’s attack on Lincoln was part of a larger plot to assassinate national leaders and throw the North into turmoil. The conspirators also planned to murder Vice President Andrew Johnson and Secretary of State William Seward. Besides Booth, eight individuals were charged. Because the plot was considered an act of war, a military commission tried the accused. The court sentenced four suspects to be hanged, and the others to prison. Booth evaded capture for 13 days. On April 26, Union officers located Booth and coconspirator David Herold in a tobacco barn near Port Royal, Virginia. Herold surrendered, but Booth refused to come out. A soldier fired through the boards of the building, fatally wounding Booth. Secretary of War Edwin Stanton ordered that the imprisoned conspirators wear hoods at all times. These canvas hoods with rope ties were made for this purpose. The accused wore the hoods in their cells and on their way to trial. In 1904 the War Department transferred to the Smithsonian the hoods, shackles, prison key, and other materials associated with the imprisonment of Lincoln’s assassins. They did not record which prisoner wore which hood. 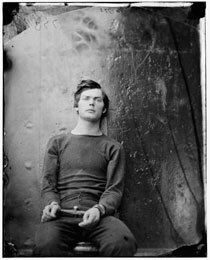 Lewis Powell attacked Secretary of State William Seward at approximately the same time that Booth assaulted Lincoln. Seward was in bed recovering from a carriage accident when Powell stormed into the house. Slashing at anyone in his way, he stabbed Seward in the chest and face several times and then fled. Though severely wounded, Seward survived the attack. 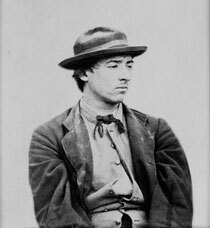 Powell, also known as Lewis Payne or Paine, was arrested at Mary Surratt’s house in Washington and identified as the attacker. He was found guilty of attempted murder and conspiracy and executed on July 7, 1865. David Herold guided Lewis Powell to the home of Secretary of State William Seward. He remained outside and left before Powell escaped. Herold later rendezvoused with Booth, and the two fled together. Union troops eventually discovered them in a tobacco barn near Port Royal, Virginia. Herold surrendered before Booth was shot. Herold was found guilty of conspiracy and executed on July 7, 1865.